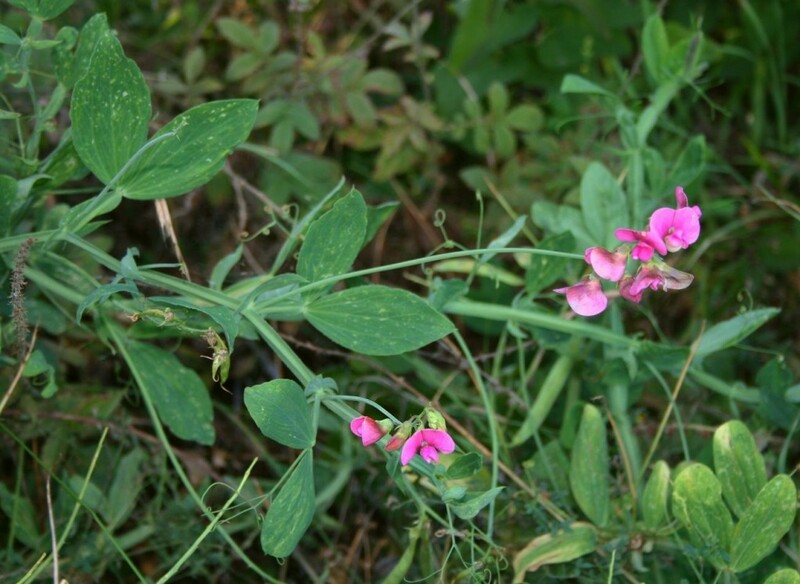 Lathyrus latifolius is a herbaceous perennial vine, from rhizomes, stems to 2 m long, pale blue-green, broadly winged, 0.5-1 cm wide; stipules 2.5-4 cm long, narrow, paired at nodes. Leaves alternate, stalk broadly winged, blade 2-parted, central leaflet replaced by a branched tendril, leaflets lance-shaped to elliptic, narrow 4-8 cm long, 1-3 cm wide, sessile. Flowers pink-purple, or white, showy, bilaterally symmetrical, pea-flower-shaped, 1.5-3 cm wide, calyx lobes very unequal. Fruit dry, hollow pod 6-10 cm long, 10-15 seeded; blooming June-Aug.
Habitat: Escaped from cultivation in open areas, fill, roadsides.